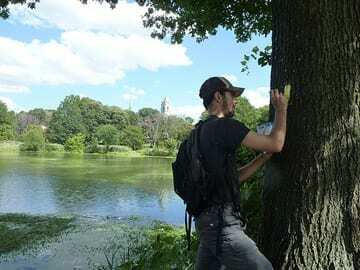 Pete Avelar painting a yellow Lenape Trail blaze in Branch Brook Park, Newark, with Sacred Heart Cathedral in background. Photo by Paul Kiczek. 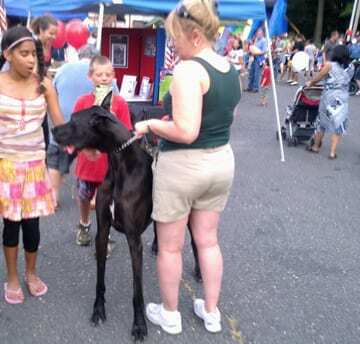 Want to see more of New Jersey? The best way to see a state or country is on foot. Here’s a Columbus Day walk through Essex County, from preserved woodland through suburbs and ending in New Jersey’s largest city, Newark. FreeWalkers, a social network for people interested in distance walking, is sponsoring The Lenape 34. 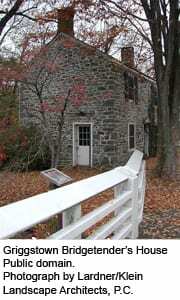 Scheduled for Columbus Day, October 11, 2010, the 34-mile walk will begin at the Millburn, NJ train station and proceed along the Lenape Trail though South Mountain, Eagle Rock, and Mills Reservations, as well as through Montclair, West Orange, Nutley, and Belleville, ending in Newark. 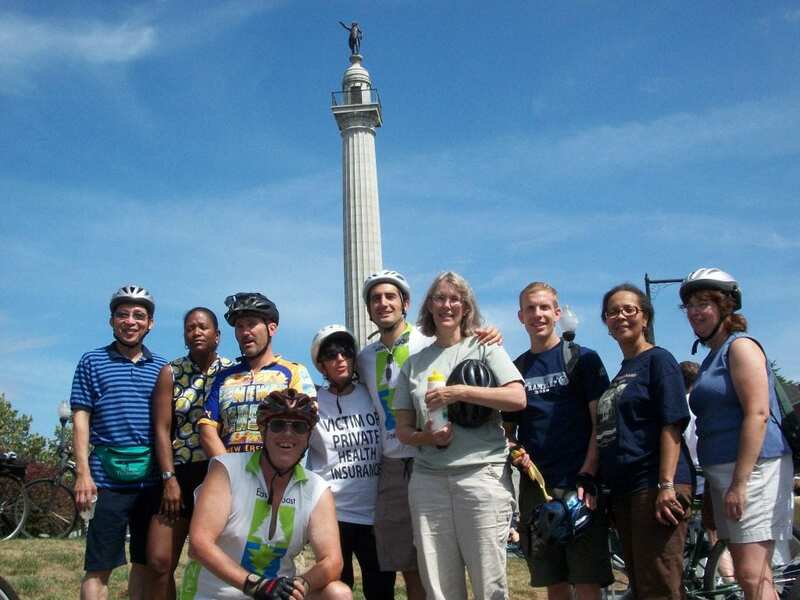 The trail walk will begin at the Millburn train station at 7 AM and conclude at Penn Station in Newark. If you’re not up for the entire trek, you can do a portion. More details are at the Lenape34 Web site. 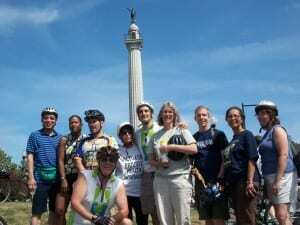 The Lenape Trail is part of the Liberty Water Gap Trail, which goes across the entire state of New Jersey (130 miles) from the Delaware Water Gap to the Statue of Liberty, through Essex, Morris, Warren, and Sussex Counties. Whether you prefer taking off-road trails or traveling via the street, check your knowledge of safe and responsible riding with these quick interactive tests. Sorry! As of May 2012, the Pennsylvania Department of Transportation has removed these tests from its website. Now pass it on to a friend. 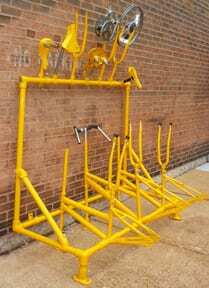 For more on bike safety, click here. What’s Behind Pedestrian Accidents in New York? New York City has just done a big study on 7,000 pedestrian-motorist crashes that have resulted in serious injuries or fatalities and their causes. As the New York Times put it, male drivers and left turns were the biggest culprits. Cabs, buses and trucks account for fewer collisions than private cars. The city already is planning a series of changes, including eliminating some parking spots so that pedestrians and left-turning motorists can more easily see each other. Other findings, according to Streetsblog: Driver inattention is the most common cause of crashes that seriously injure or kill pedestrians; failure to yield to pedestrians in a crosswalk is responsible for 27% of such crashes; speeding is a factor in more than 20% of such crashes, but most New Yorkers don’t know the citywide speed limit is 30 mph. And a lesson that is applicable to West Windsor: Not surprisingly, more crashes occur when visibility is poor. With daylight hours shrinking, think about how to make yourself more visible (such as with reflective vests, hand-held flashing lights). 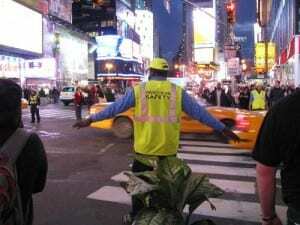 Comments Off on What’s Behind Pedestrian Accidents in New York? 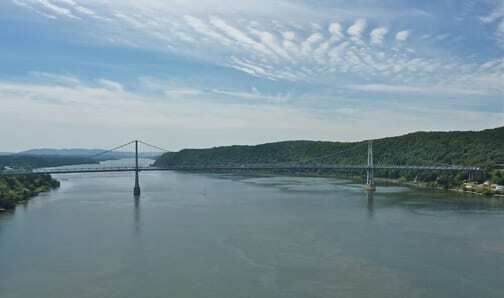 On a clear summer day, driving back to West Windsor from a bicycling weekend in New York State and Vermont, we took a break to stretch our legs along the Walkway Over the Hudson. What a treat! 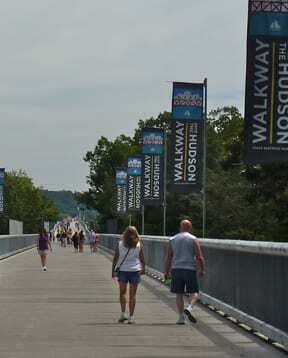 The walkway offers excellent views north and south along the Hudson, across to Poughkeepsie, down to the trains traveling along the riverbanks and to boats along the river. 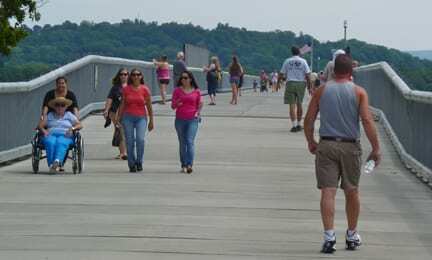 Lots of people use the walkway for exercise and sun, though there aren’t yet any benches along the span. Twenty years after a 1974 fire ruined the tracks of the Poughkeepsie-Highland Railroad Bridge, built in 1888, Poughkeepsie’s Bill Sepe began advocating to convert the rail bridge to a pedestrian and bicycle trail. The dream became a reality when the walkway opened in October 2009, celebrating the 400th anniversary of the voyage of Henry Hudson in his ship, the Half Moon, from New York harbor to the site of Albany, NY. People of all ages and abilities use the walkway, and it’s is a terrific asset for area residents or workers, who can stroll/jog/bike across and back before or after work or at lunch. Developers might not have thought there would be many people coming from the Highland side, since there were only about a dozen metered (2-hour limit) parking spaces, though we and others parked on the road without fees. As we approached Highland from the Thruway, there were a few signs for the Hudson Valley Rail Trail, which will eventually connect the Walkway Over the Hudson to the trail systems in the Shawangunks and the Catskills. Warnings on the walkway Web site note that the temperature of the concrete can be up to 20 degrees hotter than the air, so people are advised to carry water, especially for pets, and to be careful of the dogs’ paws on the hot surface. 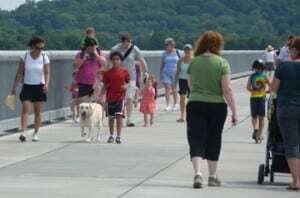 Walkway Over the Hudson Park Web site and Rails-toTrails Conservancy article. 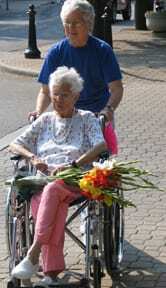 The University of Texas Health Science Center at Houston has released Professor Lex Frieden’s study (an online survey of disability leaders), Impact of the ADA on Communities, a report of the status of improvements for the disabled 20 years after adoption of the American with Disabilities Act in July 1990. The report indicates that there have been significant improvements for the disabled population. As well, the report highlights areas where more work is needed to fully implement the ADA and to enable people with disabilities to reach their goals of independence, self determination, and full participation in society. Two-thirds of people with disabilities who were polled in the study believe that ADA has been the most significant social, cultural or legislative influence on their lives in the past 20 years. The ADA’s greatest impact has been improvements in access to public accommodations. Other areas of significant agreement regarding improvement are employment, transportation, and public awareness. Overall, more than 90% of the survey respondents believe that quality of life for people with disabilities in communities across America has improved greatly since passage of the ADA. The biggest disappointment of the disability leaders who were surveyed is the lack of progress by people with disabilities toward reaching goals of economic independence. Respondents were also disappointed in the impact of the ADA on healthcare, housing, and employment. Improvements in access to public accommodations, transportation and public awareness are consistently acknowledged, but the need for further compliance is evident. Lex Frieden is Professor of Biomedical Informatics and of Physical Medicine and Rehabilitation at The University of Texas Health Science Center at Houston (UTHealth) and Professor of Physical Medicine and Rehabilitation at Baylor College of Medicine. Frieden, who uses a wheelchair following a 1967 traffic accident in which his spinal cord was severed, helped craft the ADA, which was signed into law by President George H. W. Bush on July 26, 1990. Click to read the complete report, Impact of the ADA on Communities. … with the notable exception of intersections and crosswalks, which have a large scope and must be addressed, despite a fairly long list, the work required to bring the Township’s facilities into ADA compliance is fairly modest. We suggest that by aggressively pursuing its statutory requirements, the Township could gain statewide prominence as a community friendly to the needs of its many disabled residents and visitors. Such action would certainly be recognized at least at the state level by government and the many organizations representing the disabled. Click to read the February 2010 WWBPA report. Researchers at the University of Buffalo report that a morning walk to school could reduce the amount of stress children feel later in the day. Heart rate and blood pressure levels remain lower, which can reduce the risk for cardiovascular disease later in life. Think kids don’t get stressed? Remember how you felt taking a test, speaking in front of classmates and just trying to fit in. Other studies suggest that being fitter helps make kids smarter. Encourage your children (and yourselves) to get more exercise! Form a walking school bus or bicycle train, both of which promote safe routes to school. Read more about our Walk to Hawk program. Let us know if you’d like to start a similar program in your child’s school. Johnson Trolley Line Bridge on the Ewing-Lawrenceville Boundary looking south into Ewing. Jim Castelize working to clear brush, June 2010. Another trail to discover in Mercer County: the just-renovated section of the Johnson Trolley Line connecting Whitehead Road Extension in Ewing with the portion of the Johnson Trolley Line in Lawrenceville. 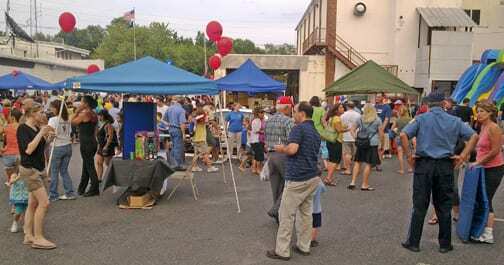 WWBPA member Van Cotter, a member of the Ewing Environmental Commission, reports that it is now walkable and bikeable with mountain and touring bicycles. The trail surface is hard-packed dirt/cinders with some rocks and a few old rail ties. In wet weather, there are some puddles. The trail passes through pleasant mixed deciduous forest including many native tree species: ash, oak, maple, sassafras, etc. Biking/walking north, the trail crosses a bridge into Lawrenceville and picks up the Johnson Trolley Line in Lawrenceville. 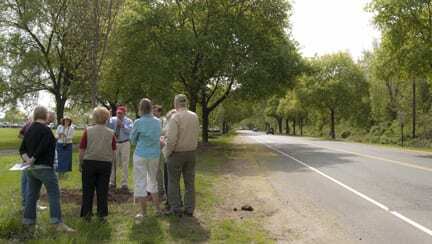 The trail there is broken by I-95, and there is talk of creating an overpass over the interstate to reconnect the Johnson Trolley Line, similar to what was done for the D&R Canal over Route 1. The trolley line that ran along this route once connected Princeton and Trenton. 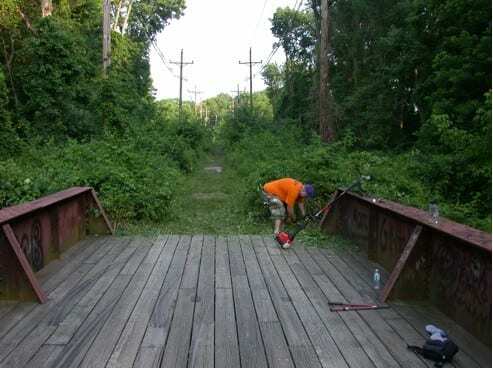 The trail renovation was a joint effort of the Ewing Environmental Commission, Ewing Township Department of Public Works, and local Boy Scout Troop 15. Future work could include extending the renovation south to Spruce Street in Ewing. This section is privately owned and thus will require securing permission from the owner(s). Other work could include painting the bridge at the Ewing Township-Lawrenceville line and adding signs identifying the trail. More HAWKs Light Up Across the U.S.
HAWKs are High-intensity Activated Cross Walk lighting systems and are a way to let pedestrians cross busy roads without a standard traffic light. The signal stays dark until pedestrians or bicyclists want to cross. They press a button, and the overhead signals flash yellow lights, followed by a solid yellow and a solid red, stopping traffic so the people can cross. Researchers with the Texas Transportation Institute at Texas A&M University last year compared before-and-after accident data at 21 HAWK sites in Tucson, Arizona and found a 13% to 29% reduction in all crashes and a 50% drop in pedestrian accidents. More states are installing them, as USA Today recently reported. The WWBPA thinks one place it could work in West Windsor is at Sherbrooke Drive and Princeton-Hightstown Road so that pedestrians can cross from the Sherbrooke development to the Acme shopping Center. Comments Off on More HAWKs Light Up Across the U.S. 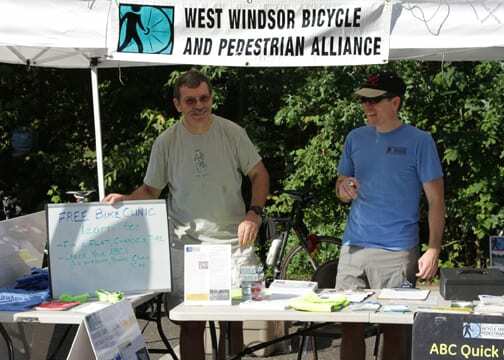 The WWBPA provided a free Bike Clinic at the Farmers’ Market on Saturday, August 7. We offered people an opportunity to learn how to fix a flat, change a tire, check their ABC’s (air pressure, brakes, cassette/chain/crank), and fit their bike. First Vice-President Chris Scherer brought his bike for demonstrations, and he reported that one woman went home and then rode her bike back to the market. Chris and WWBPA Trustee Dave Robinson showed her how to fix a flat and change a tire, and went through the ABC’s with her, plus fit her with a helmet. She got some hands-on experience and seemed to learn a lot. Several others expressed interest in the clinic and may bring their bikes to the Farmers’ Market on August 21 for another clinic. Stop by at any time between 10.m. and noon. We’ll also do demonstrations at 10 a.m., 11 a.m. and noon on September 4. 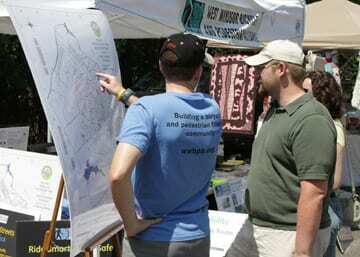 In addition to the Bike Clinic, we spoke with many people about bicycle and pedestrian matters. 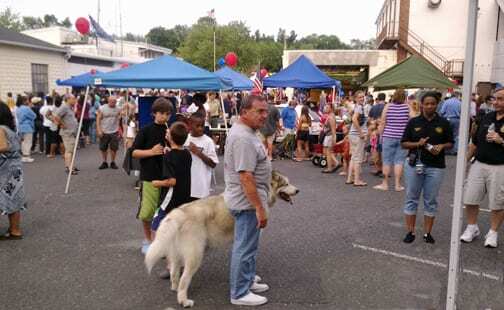 Many were interested in connections, such as between Princeton and West Windsor or Plainsboro and West Windsor, and finding routes to destinations, such as Whole Foods from Plainsboro or Hightstown or Mercer County Park from Cranbury Road. 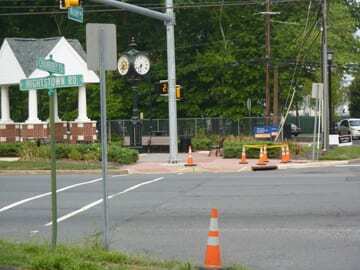 Washington Road and the intersection at Cranbury/Wallace and Route 571 were mentioned many times. 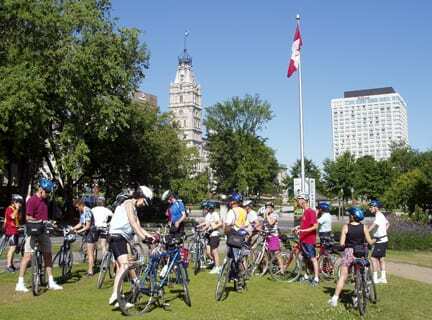 If you, too, are interested in attending a Bike Clinic at the Farmers’ Market, send us an e-mail or leave a comment here and we’ll do our best to accommodate you. Interested in more routes in the U.S.? Click for the Top 10 American Bicycle Routes. Want rides closer to home? 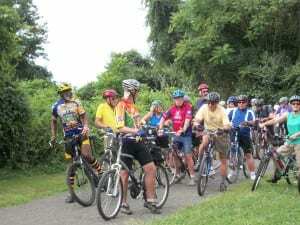 Click for Regional Biking and Walking Routes. Traveling to a different part of the country? Want to bicycle when you’re there? 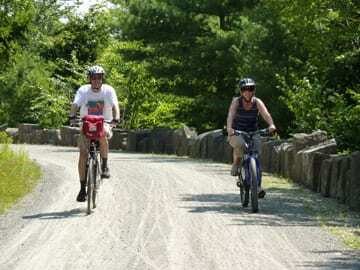 HotelsCombined.com has released its Top Ten American Bicycle Destinations, with trails for various ability levels, throughout the country. Or go to Trails.com and search for a trail (hiking, biking, or backpacking) where you’re heading. Interested in cycling the world? Check out National Geographic’s Top 10 Cycle Routes. What trail would you recommend? How walkers will be able to cross at the intersection with Carnegie Center Boulevard. Read the WWBPA letter suggesting fixes for both the bike lanes and the sidewalk. These kids know their bike safety! 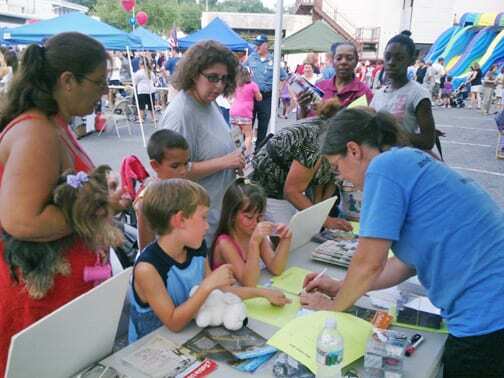 The WWBPA joined the crowds at Hightstown’s National Night Out. Dozens of kids took our bike safety quiz. How would you do? We also sold safety gear and gave away a few helmets–all part of educating the next generation of bicyclists. Mercer County Executive Brian Hughes has come out in favor of a more bicycle-friendly county and appears ready to back his words with deeds. The WWBPA is delighted with the county’s bike-friendly philosophy. The comment period for the mobility element of its master plan ends Aug. 15. A bike-friendly master plan makes it easier to turn our vision into reality. Let officials know what’s important to you! Eighty-six percent of teens admit to driving while distracted (AAA and Seventeen Magazine Survey). 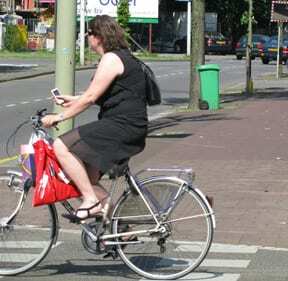 Bicyclists and pedestrians also become distracted when they use cell phones and text. They need to be fully alert when cycling or walking so they can see and hear everything around them. Go to Seventeen to learn more. Upload your anti-distracted driving video to YouTube by September 10. Then tell all your friends to view it. And let Seventeen know, too–you could win $2,000. Click here for the rules. Sponsored by Seventeen.com, Exchange.aaa.com, and Distraction.gov.